Are you ready to be “the boss”? In this free e-book, we provide an introduction—a primer, if you will—to the complex world of becoming a successful owner of an A/E firm. Becoming an owner is a personal decision, a career decision, and a financial decision that represents a major commitment. Before you take that leap into the unknown, let us arm you with what you NEED to know to run the show. 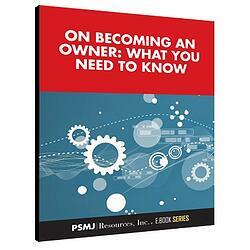 Whether you’re in the process of becoming an owner, you’ve just started thinking about it, or you just know you want to be an owner someday, you’ll want to read this e-book. Download your free copy today!